“One more kiss?” her small voice asks out of the darkness, gravelly with sleep. 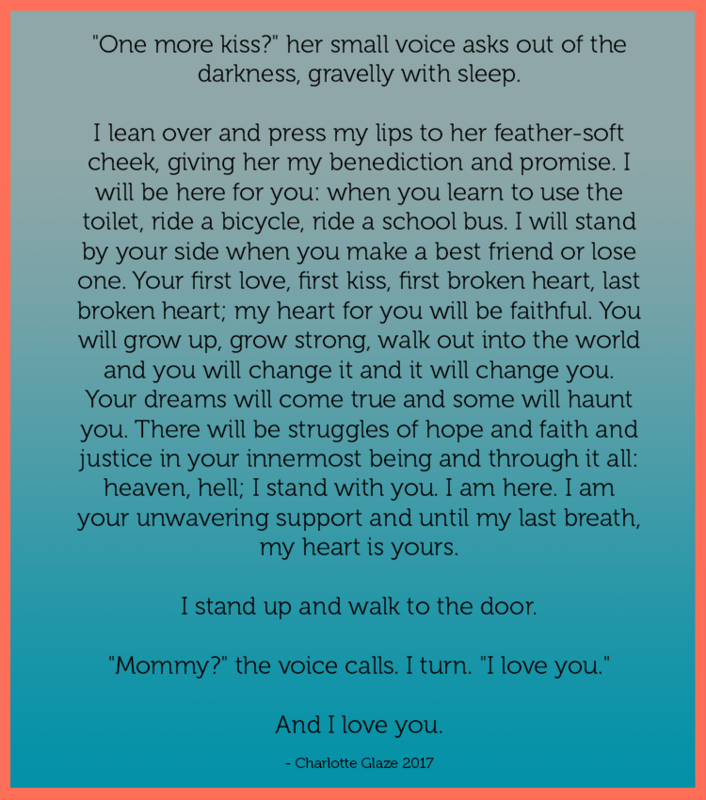 I lean over and press my lips to her feather-soft cheek, giving her my benediction and promise. I will be here for you: when you learn to use the toilet, ride a bicycle, ride a school bus. I will stand by your side when you make a best friend or lose one. Your first love, first kiss, first broken heart, last broken heart; my heart for you will be faithful. You will grow up, grow strong, walk out into the world and you will change it and it will change you. Your dreams will come true and some will haunt you. There will be struggles of hope and faith and justice in your innermost being and through it all: heaven, hell; I stand with you. I am here. I am your unwavering support and until my last breath, my heart is yours. I stand up and walk to the door.